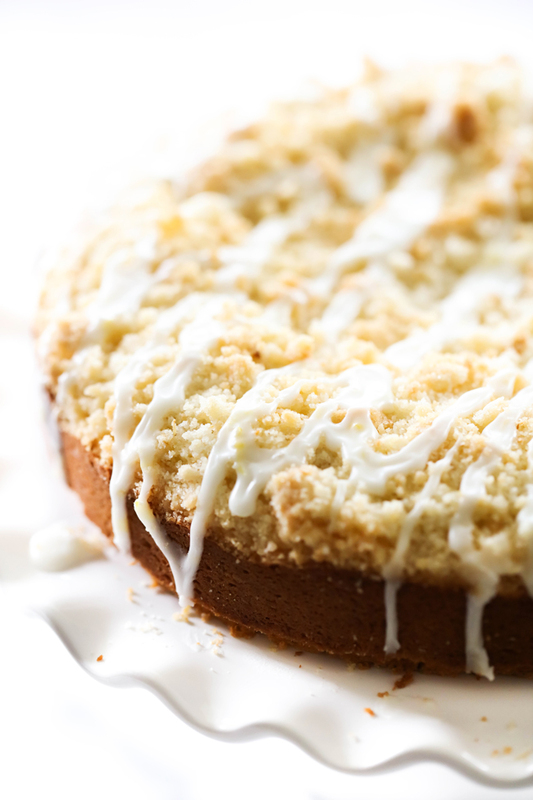 This Lemon Crumb Cake is refreshing and has the perfect crumble on top. 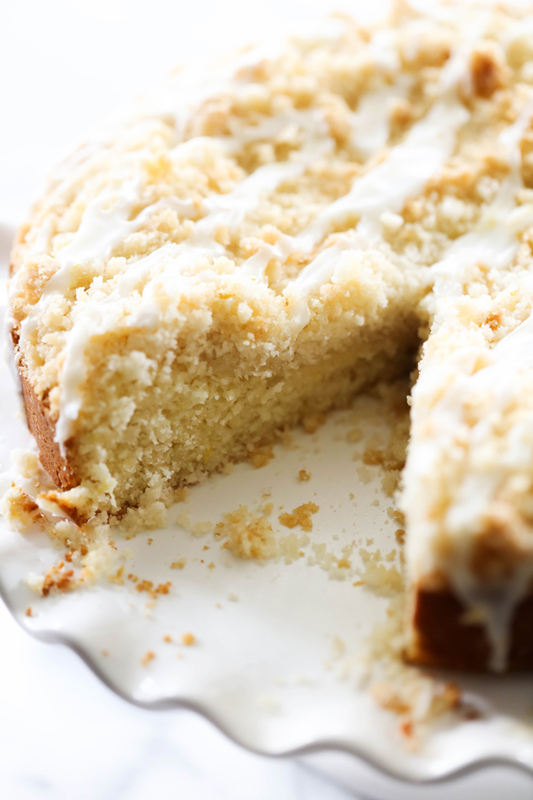 The cake is moist and the crumb topping is the perfect addition to compliment it. It has a beautiful lemon citrus flavor is perfect. Lemon has become one of my favorite flavors in desserts, breakfasts, dinners. It is such a universal ingredients that suits so many different types of recipes both savory and sweet. 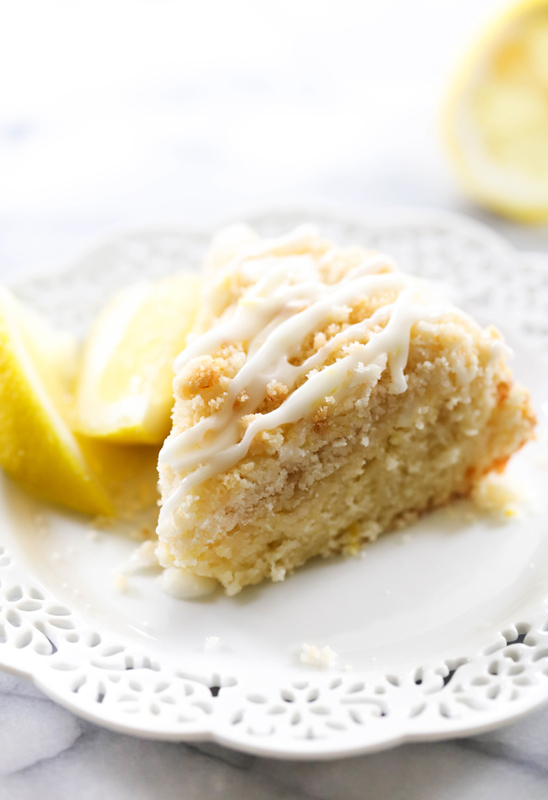 Today’s recipe is a delicious crumb cake where Lemon is the star flavor. It is not overbearing but rather subtle and just the right amount. The crumb topping is divine and pairs wonderfully with the moist cake. The glaze is the perfect finishing touch. This recipe would make for a wonderful breakfast or dessert recipe. It was a huge hit with my whole family and will definitely be a recipe I revisit over and over again! Spray springform pan with vegetable cooking spray. In a large mixing bowl beat butter and sugar until creamy. Add egg and sour cream mix again. Add lemon zest and lemon juice and mix again. Sift together salt, baking powder, and four and stir into the wet mixture. DO NOT OVER MIX! In a small mixing bowl combine butter, sugar, flour, and lemon zest with a fork until crumbly. Bake for 30 to 35 minutes or until done. To determine when cake is done insert a long toothpick. If it comes out clean it is done. Carefully remove cake from springform pan and place on cake stand. If you love this recipe, you will love these!